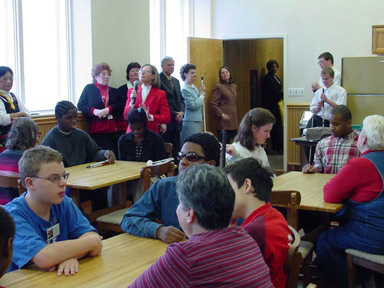 Students gathered in the Harbor Room, where Barbara Cheadle talked with them about the significance of the fact that blind students now have access to some of the photos their sighted friends have been able to study for years. 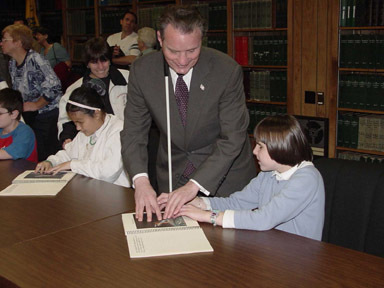 Thursday morning, November 21, a large group gathered at the National Center for the Blind to celebrate the publication of a sixty-four-page book titled Touch the Universe: A NASA Braille Book of Astronomy. Blind students from five states (Washington, Colorado, Michigan, Maryland, and New York) came to the event. The visitors had a chance to explore NFB headquarters as well as get their hands on the book with its fourteen photographs taken by the Hubble Telescope. The book presents color images of planets, nebulae, stars, and galaxies. Each image is embossed with lines, bumps, and other textures. The raised patterns translate colors, shapes, and other intricate details of the cosmic objects. The book also incorporates Braille and large-print descriptions for each of the photographs. Several officials from the National Aeronautics and Space Administration (NASA) took part in the morning's activities. 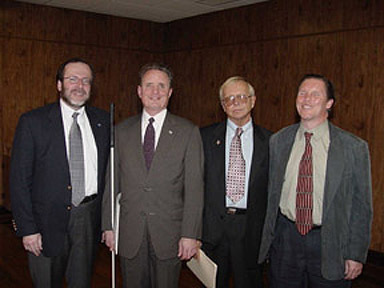 Pictured left to right are Mr. Courtney Stadd, NASA chief of staff and White House Liaison; NFB President Marc Maurer; Dr. Edward Weiler, NASA Associate Administrator, Office of Space Science; and Dr. Kent Cullers, blind radio astronomer and director of the Search for Extraterrestrial Intelligence R&D, SETI Institute. 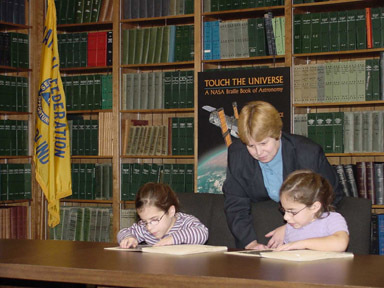 In the large conference room at the Center, students were able to examine copies of Touch the Universe. Here Amy Herstein of Maryland inspects one copy of the book while President Maurer leans over Jenny Suchan of Maryland as they both examine another. Also in the conference room, book author Noreen Grice shows a copy of Touch the Universe to Mikaela Stevens of Washington (left) and her twin Makenzie (right). A large book poster can be seen behind them. 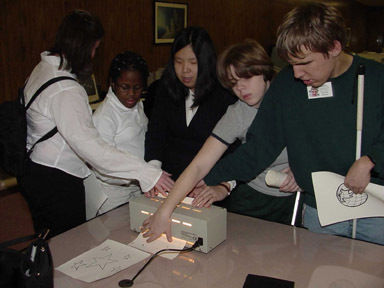 Anne Taylor of the International Braille and Technology Center for the Blind staff demonstrates the Tactile Image Enhancer Junior to a group of students. They are examining an astronomy picture downloaded from the Internet.